Walt: write a detailed introduction with hook and orientation. Have you ever seen your teacher in a video game of superheroes? 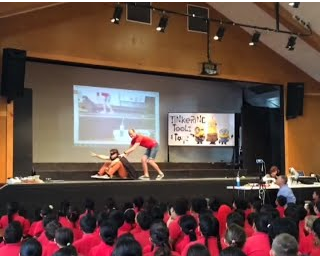 Well today we had our second immersion assembly of the year, this terms topic is Tinkering, Tools and Toys. Read on for more information. It was time to go to our immersion assembly, we lined up outside. As we started to walk in to the hall I saw that the teachers were baking. Iisa was also flying a drone helicopter that was controlled by Mr Burts phone, isn't that interesting. We then sat down in our class lines. The teachers and prefects started to hand out the food. Then Mr Burt started to talk about our new Topic and Term, Tinkering Tools and Toys. This term is all about T’s. The teams then started to do there items. It started with Team 1. Team 1’s topic was healthy body, healthy park and healthy food. When Team 1’s movie was playing they started to hand out food such as carrots, sandwiches and more. Its time for Team 2. Team 2’s topic was about Winnie the Pooh. It was when Eeyore did not like his house any more so Piglet, Winnie and Tigger then tried to think of a solution about how to fix Eeyores house. Team 3 coming up. It was time for team three to do there item. There item was something about minions. The team 3 teachers were in minion suits. Team 4’s turn. Team 4’s topic is Wet lunch games and how we can make them better. We have to create an animation of somebody in a video game. Yes what can make wet lunch games better? Video games. Time for Team 5, Team 5’s topic is about Army and How we can make things better for Team 5. Then it was Mr Barks turn. Mr Barks made a hovercraft. A hovercraft is a plastic circle that you sit on, then you blow air. First Mr Barks showed us what it was. He then got Mr Somerville to have a turn. Mr Somerville was having fun I bet. I think our immersion assembly was very interesting because they were doing extra things. The assembly made me think of what I can do better, and how will I make it better. Over all the assembly was very cool and interesting. Description:My task was to write a recount about our immersion assembly. We were to write a detailed intro on the first day then the next two days we had to finish of the rest. We were to write 3 or 4 body paragraphs , an intro and a conclusion. Crazy teacher invents a new Tetris controller. Yay, Few more hours till Easter.